The hospital is located on St Nicholas's Road in Salisbury. It was built by Bishop Robert Bingham in the early-to-mid 13th century, possibly at the same time as Bishop's Bridge, which was created to divert traffic off the main road into New Salisbury. 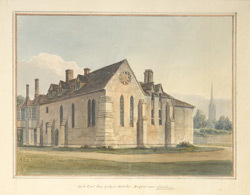 The hospital had a right and left range and a church, although the nave is now gone. The hospital buildings began to be used as almshouses in the late 18th century, when the Salisbury general infirmary took over the care of the sick in the area. The infirmary was designed by John Wood the Younger.